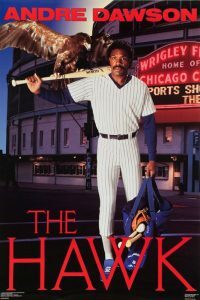 My favorite Cub of all time is Andre “The Hawk” Dawson. I can remember the day that he signed in the spring of 1987 with the Chicago Cubs like it was yesterday. My grandmother an I where driving around town when the news broke on the radio. After we heard the announcement we were both very excited because we felt he was the missing piece the Cubs needed to get to the promise land. Andre was a free agent after many years playing at Olympic Stadium’s artificial turf. His knees could no longer take it and luckily for Cubs fans he wanted to leave Montreal and come to Chicago to play at beautiful Wrigley Field and particularly on the natural grass. However, due to collusion on the part of the Major League Baseball owners, he was unable to attract offers. Dawson made the Cubs aware that he wanted to play for them. Dallas Green the GM of the Cubs at the time was unsure of the production a player like Dawson could bring and felt they already had a player (Brian_Dayett) already with the ball club to play right field. The Cubs opened spring training in Mesa,AZ that year and Dawson was still unsigned. Dawson and his agent in an attempt to get Greens attention showed up with a blank contract to entice the Cubs to sign him. Green did not appreciate the offer and called it a “dog and pony show”. Once Green got past this he reviewed the contract and the two sides agreed on a salary of $500,000 a year. The second-lowest salary on the Cubs among regular players. The contract had additional incentives including $150,000 if he did not go on the disabled list by the All-Star Game break and $50,000 if he made the All-Star team. He was able to earn both. 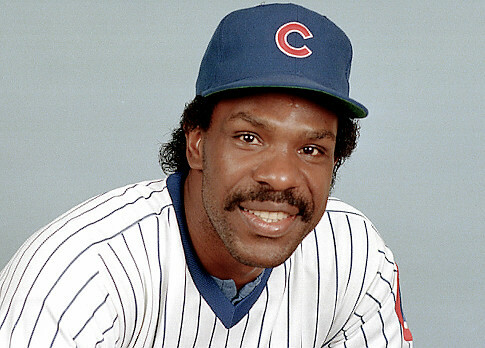 The Cubs also wrote in $100,000 in bonuses if Dawson was able to win the MVP of the league championship series or the World Series, but did not add a clause for the NL MVP which he won while the Cubs finished the 1987 season at 76-85, last in the National League East. Dawson was the first player to ever win a league MVP trophy for a last place team. Dawson went on to play 5 years for the Cubs. In 1989 the Chicago Cubs won the NL east and faced the San Francisco Giants. Unfortunately for him and the Cubs his struggles throughout the season followed him into he playoffs and he hit .105 in the series which contributed to the Cubs losing the series 4 games to 1. Dawson finished his career with 2,774 hits, 438 home runs, 314 stolen bases, and 1,591 RBI. He is one of only eight players in major league history to record over 300 home runs and 300 stolen bases in his career and is a member of the exclusive 300-300 club. Dawson is also one of only five members of the 400 HR-300 Stolen Base club. Dawson was elected to the Baseball Hall of Fame in 2010, his ninth year of eligibility. Unfortunately for Die-Hard “Hawk”/Chicago Cubs fans his Hall of Fame plaque depicts him with a Montreal Expos cap. His Chicago Cubs teammate and friend Ryne Sandberg campaigned for Dawson in his own Hall of Fame induction speech in 2005 by saying the following about Andre.